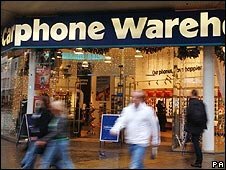 Carphone Warehouse is to buy the UK assets of Italian internet service provider Tiscali for £236m. The deal, which is expected to be completed by the end of June, will create the UK's largest home broadband provider with 4.25m subscribers. Tiscali had previously been in talks with BSkyB, but negotiations broke down earlier this year. Carphone Warehouse currently provides broadband services under its TalkTalk brand and via AOL Broadband. Carphone chief executive Charles Dunstone said that the company would eventually just have a single brand. But he added that Tiscali e-mail addresses would survive. "We know the business well and the fit with TalkTalk is perfect," Mr Dunstone said. Completion of the deal will give TalkTalk more than 25% of the residential broadband market. Carphone expects it to boost its earnings by 10% in the next year. Shares in Carphone Warehouse were up 3.8% by midmorning. Tiscali shares, which were earlier suspended in Italy pending the statement, were up 8%. Tiscali has struggled with its debt, which stands at about 600m euros ($805m;£535m). It is the fifth largest internet service provider in the UK, with 1.45m broadband customers. "The transaction should be considered in light of the strong consolidating trend in the highly competitive UK market, evaluating Tiscali UK activities as a whole, thus preserving the value of its industrial assets and know-how within the Carphone Warehouse Group," said Mario Rosso, chief executive of Tiscali. Carphone announced plans last month to separate its mobile phone business from its TalkTalk fixed line and broadband operations. It operates 2,400 mobile phone shops across Europe in a joint venture with the US retailer Best Buy.